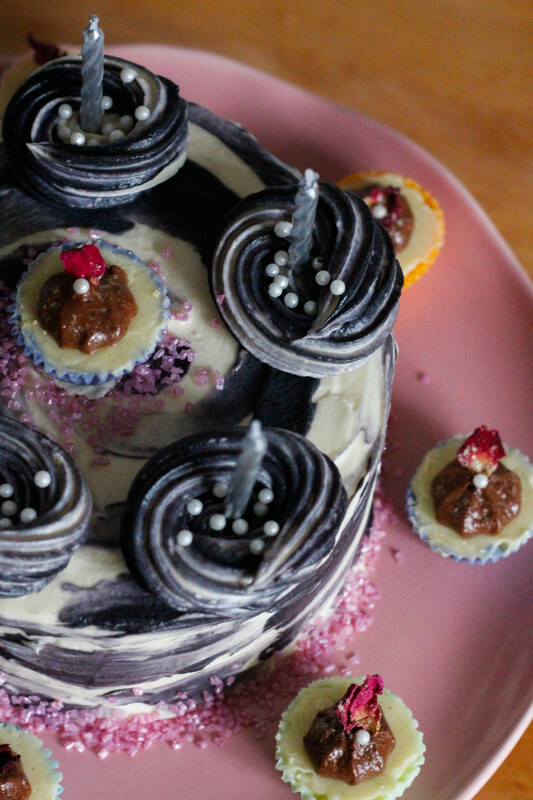 I realise there are only five candles on this cake, but fitting twenty-five of them onto a six inch cake… that would just be messy. Pearls? Crystals? Glitter? Alright, so I may have gone a little crazy with the decorations. 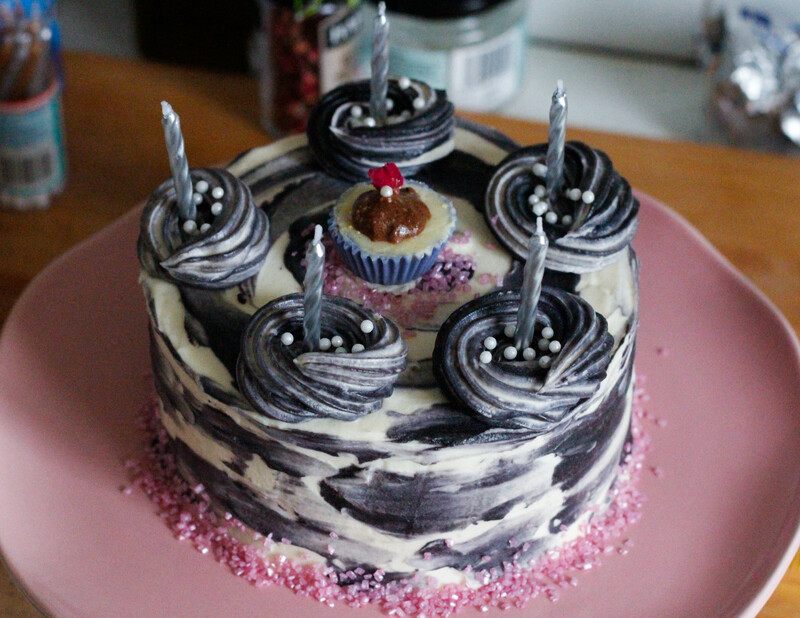 But I had never actually made a cake for myself. 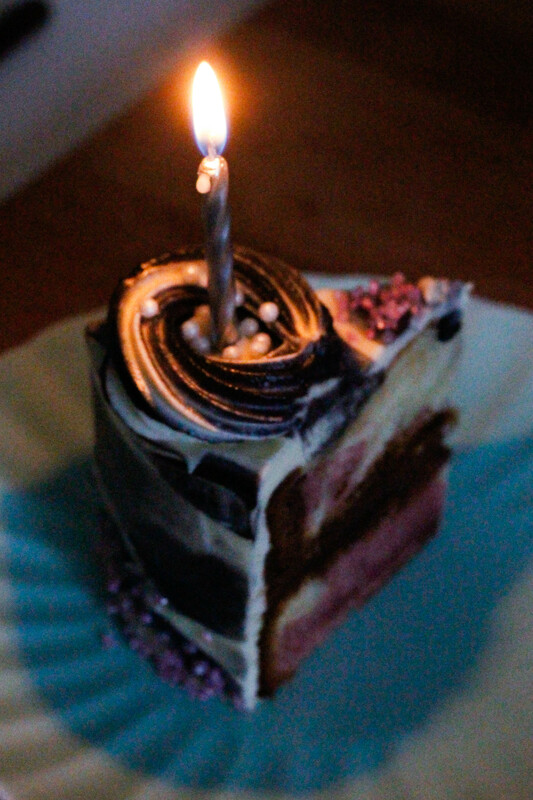 I couldn’t bear the thought… A cake from a shop? 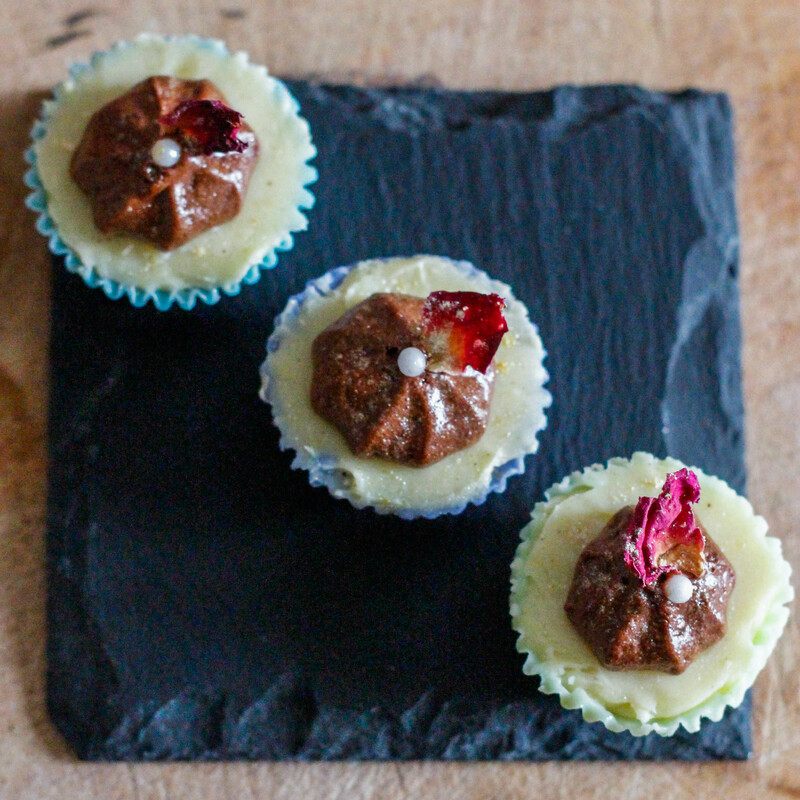 Yes, yes, I know… other people bake cakes too, but why should we buy one when I can just make it? 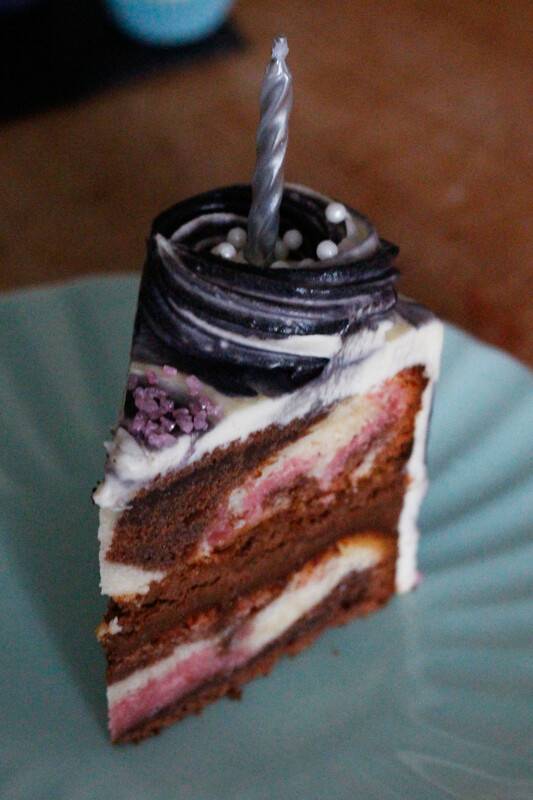 Yes, I could make it… A birthday cake for myself. Why not? 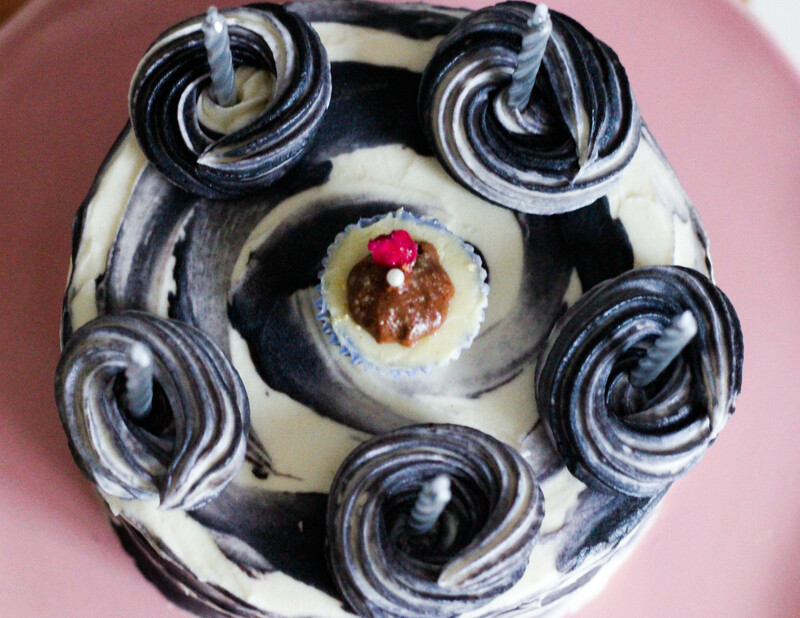 I could make a cake designed with me in mind and me alone…. 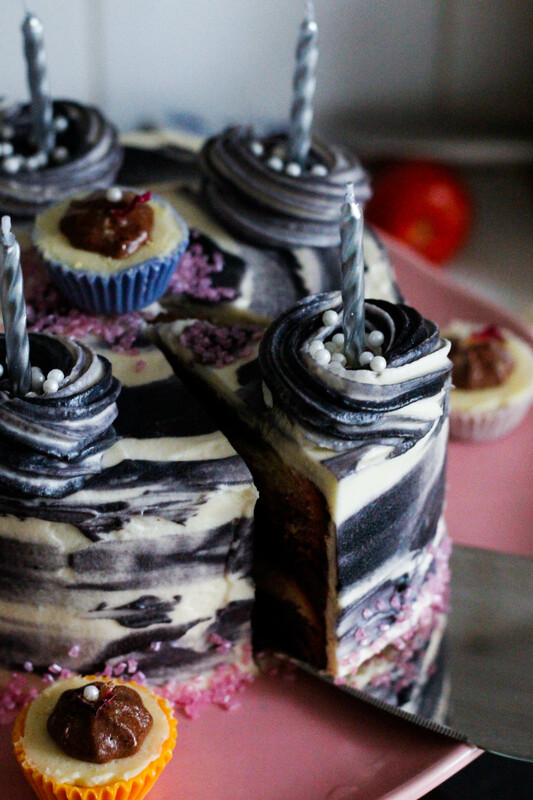 Packed full of chocolatey goodness that I just know my other half won’t appreciate… no matter, It’s my birthday, I’m allowed to eat a whole cake on my own… right? So, I was really going to do this, and chocolate was invariably going to be involved, but what next? 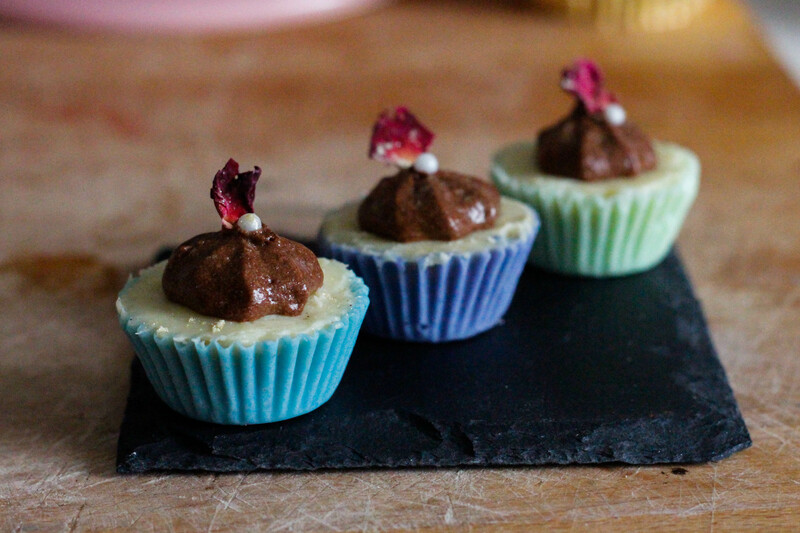 I was picturing a black and white cake, but these little ice-cream coloured chocolate cups kept entering my mind… and then with that came the Neapolitan flavours and their delightful marbled appearance. And then there was the coconut… but… but… I also love pistachio! 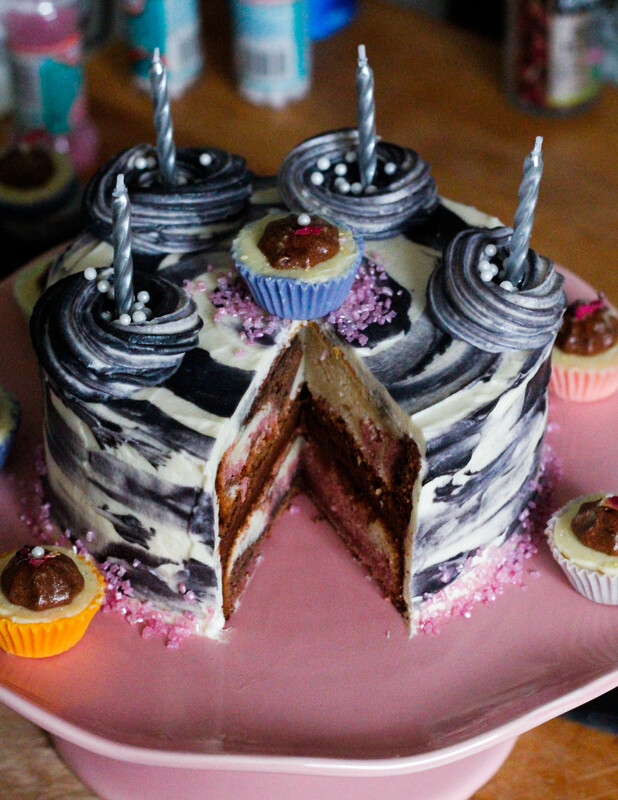 Oh gosh… this cake could get messy. And it did… As we’ve established. In the end, I figured it didn’t matter…. It was my cake, and I was just going to let it be what it wanted to be. 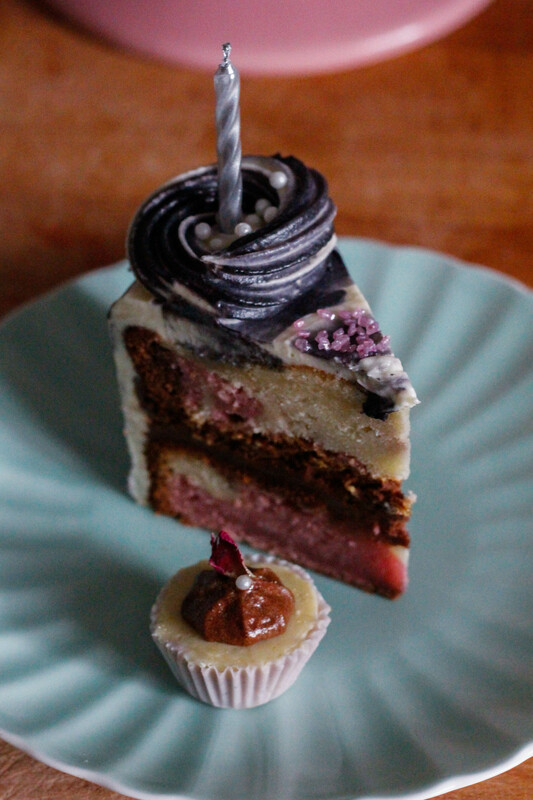 So… Two layer Neapolitan marble cake filled with rich chocolate mousse & strawberry jam, silky white chocolate & cream cheese cooked flour frosting, and mini white chocolate, coconut & dark chocolate mousse cups. And, inevitably, there were a couple of cupcakes involved too.. The flavours of the Neapolitan marble cake are subtle – I’ve used only fresh strawberries for the strawberry flavour, but you could add a teaspoon of strawberry extract if you’d like it stronger. 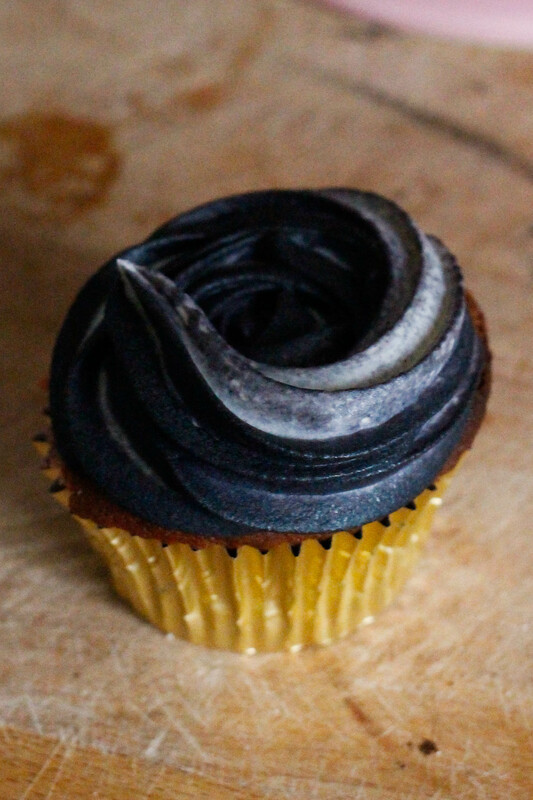 The cooked flour frosting is flavoured with white chocolate and cream cheese – it is incredibly light, smooth and silky and has fast become my favourite(!) frosting. 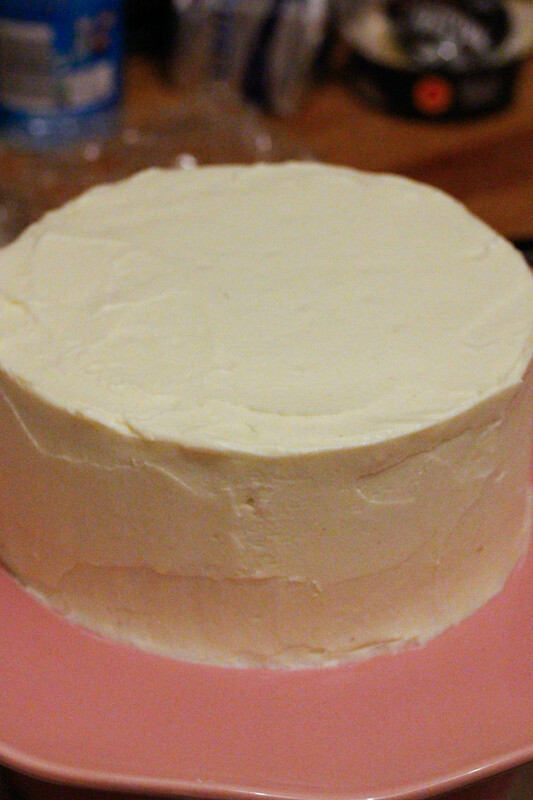 Less structured than a meringue buttercream, it still pipes very well but is best to work with in a cool kitchen! 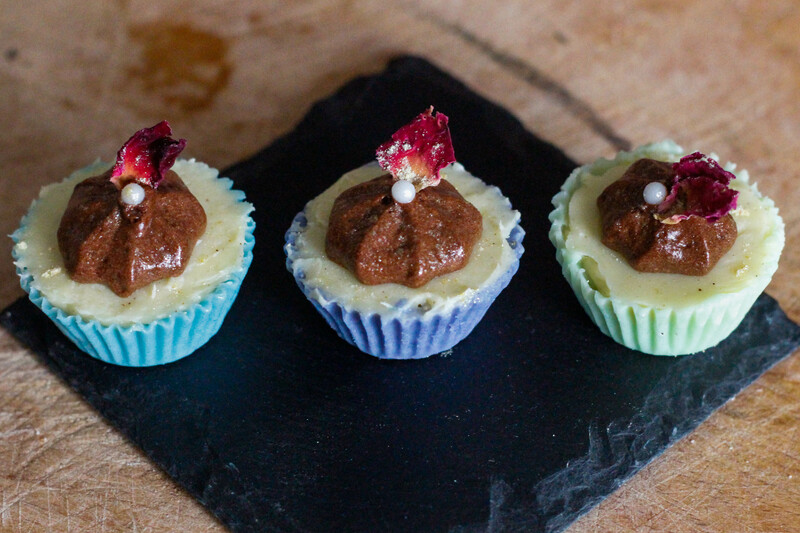 The chocolate mousse is made the traditional way with eggs and chocolate alone, no cream. I used a small amount of milk chocolate with the dark and added a little bit of sugar, and I found it was just about perfect as a dark chocolate mousse for me. It is very rich and not too sweet. 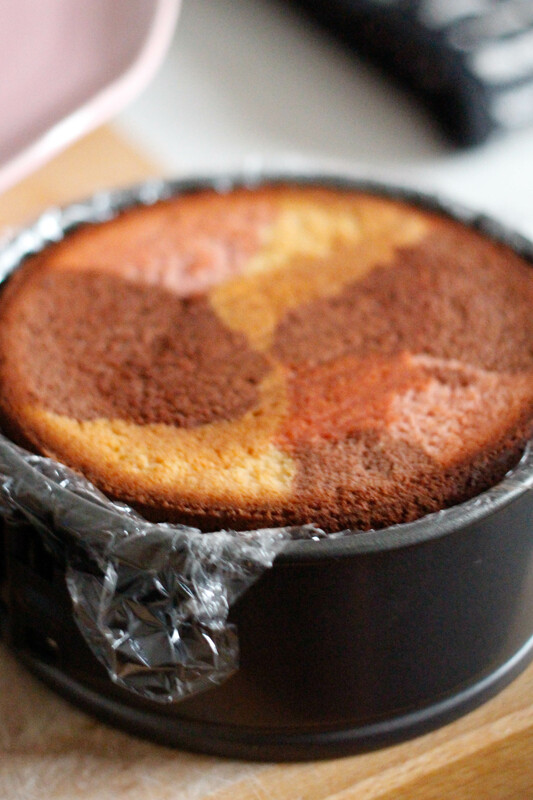 Preheat oven to 180°C/350° F/Gas Mark 4, then grease a 6″ (15cm) cake tin and line the base with baking paper. Cut the strawberries into quarters, then place them into a saucepan with 100g sugar and 50ml water and bring to a boil. Reduce heat and leave to simmer until the strawberries have broken down and the mixture has thickened to an almost jam-like consistency, then set aside to cool completely. Tip: Add a little more water if the mixture has reduced too much but the strawberry pieces have not broken down enough, and continue to simmer. Combine the brown sugar and cocoa powder for the chocolate cake mix and add the boiling water. Stir to a paste and set aside. Gently melt the white chocolate and double cream over a double boiler, then set aside for the vanilla cake. Cream the butter and 155g sugar, then add one teaspoon of vanilla extract and beat in the egg yolks one at a time. Place the ricotta into a measuring cup, then add the whole milk, bringing the total volume up to 160ml. Whisk to combine. Add the flour mixture to the creamed mixture one third at a time, alternating with the milk and ricotta, starting and finishing with the flour. Divide the mixture evenly into three separate bowls to make the different flavoured cakes. To make the strawberry flavour, beat in 90g of the cooled strawberry jam to the first bowl. To make the vanilla flavour, beat the melted white chocolate and vanilla bean paste into the second bowl. To make the chocolate flavour, beat the cooled chocolate paste into the third bowl. Whip the egg whites to soft peaks, then gradually add in the final 20g of sugar and continue to beat until the peaks have stiffened. Fold a third of the beaten egg whites into each of the bowls containing the three flavours. 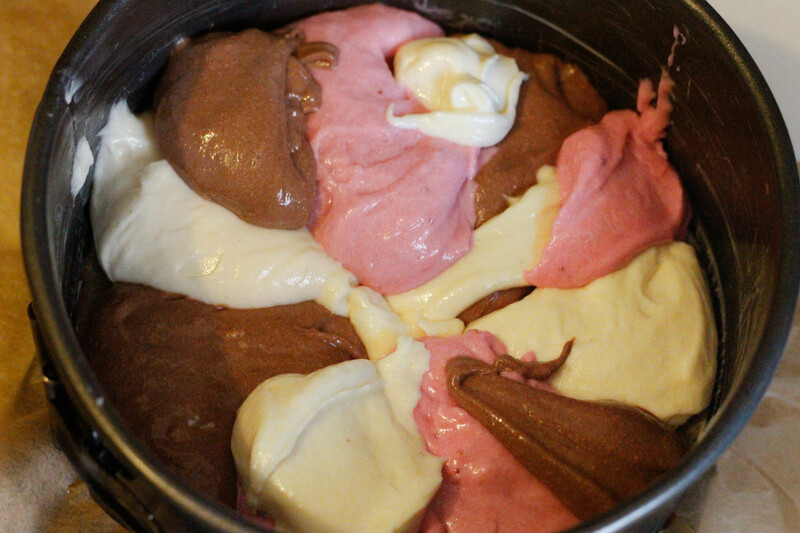 Place alternating spoonfuls of the cake mixtures into your prepared cake tin, using up half of each flavour. The remaining halves will be used for the second cake layer. Bake in the preheated oven for 30 minutes, or until cake skewer comes out clean. (For cupcakes, bake for 15-20 minutes). 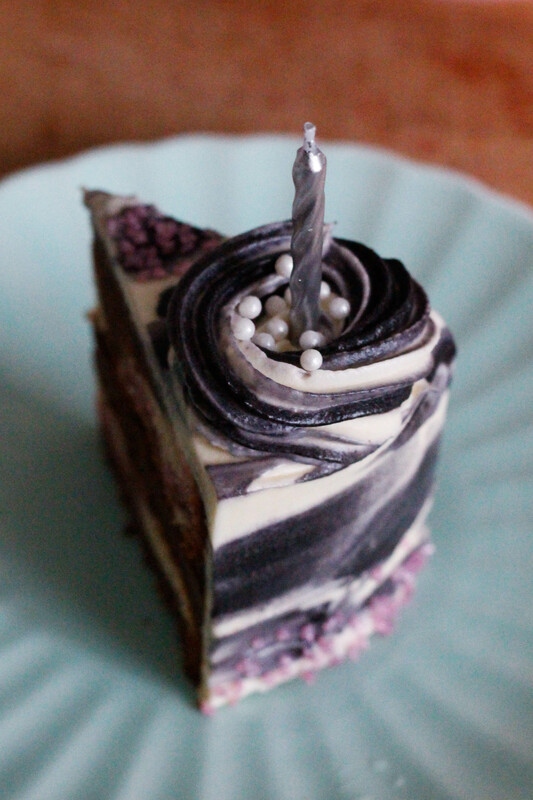 Tip: The cake will be quite spongey, but won’t bounce back readily when you press it – don’t mistake this for it not being ready, if the skewer comes out clean take it out of the oven! 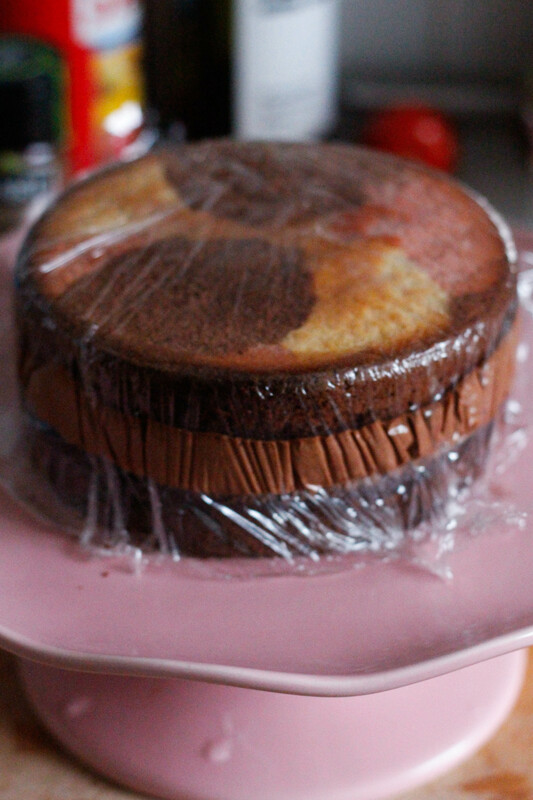 Once the cake layers have cooled completely, line the cake tin you used to bake the layers with cling film and place one layer back inside. Spread a thin layer of the strawberry jam over the cake and set aside. 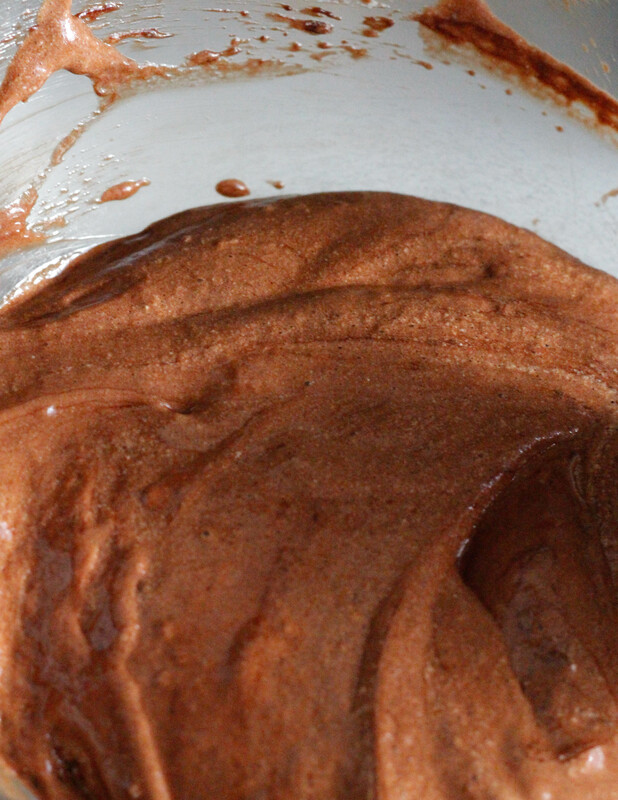 To make the mousse, melt the chocolate over a double boiler. Once the chocolate begins to melt, separate the eggs. Turn off the double boiler once the chocolate has melted and whisk the egg whites to soft peaks. Add the sugar, and continue to whisk until the peaks have stiffened slightly. Whisk the egg yolks into the melted chocolate, then add a spoonful of the egg whites to loosen the mixture. Fold the remaining egg whites into the chocolate mixture until just combined. 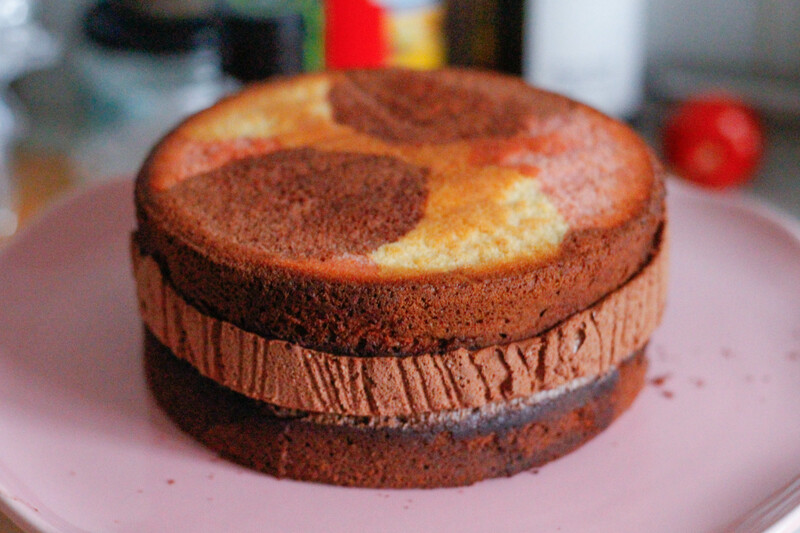 Pour three quarters of the chocolate mousse onto the cake in the cake tin, then spread a layer of jam over the surface of the second cake layer and gently place it on top of the mousse layer, jam side down. Refrigerate for at least three hours. Attach a star tip to a piping bag and tape the end up, then pour the remaining mousse into the bag to use for topping your white chocolate & coconut ganache cups and refrigerate. Line a mini cupcake tray with mini cupcake cases, then melt 100g of white chocolate either gently in the microwave or over a double boiler. 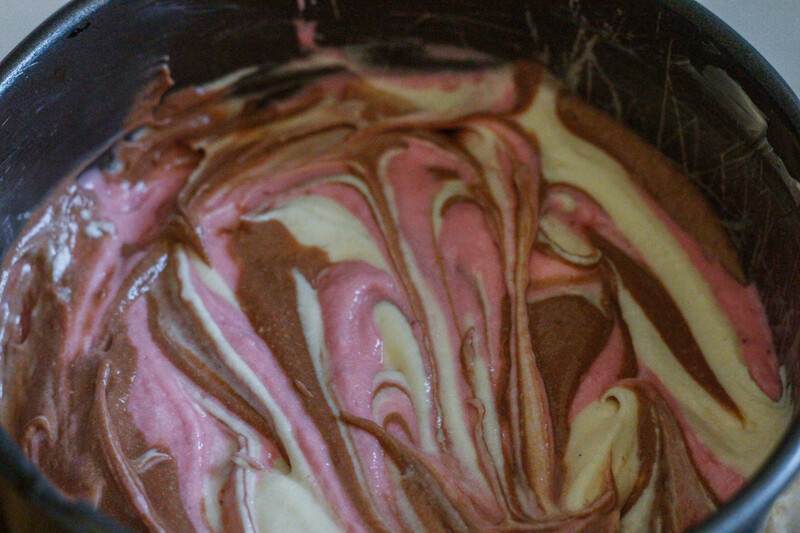 Colour a teaspoon of chocolate at a time (if using colours) and then spoon into one of the cupcake cases. Use the back of the spoon to spread the chocolate up the sides of the cupcake case, then repeat with the remaining chocolate. Place in the freezer until ready to fill. To make the ganache, melt the reamaining 100g of white chocolate with the 50ml of double cream, stirring over a double boiler. Once melted, add the coconut extract. 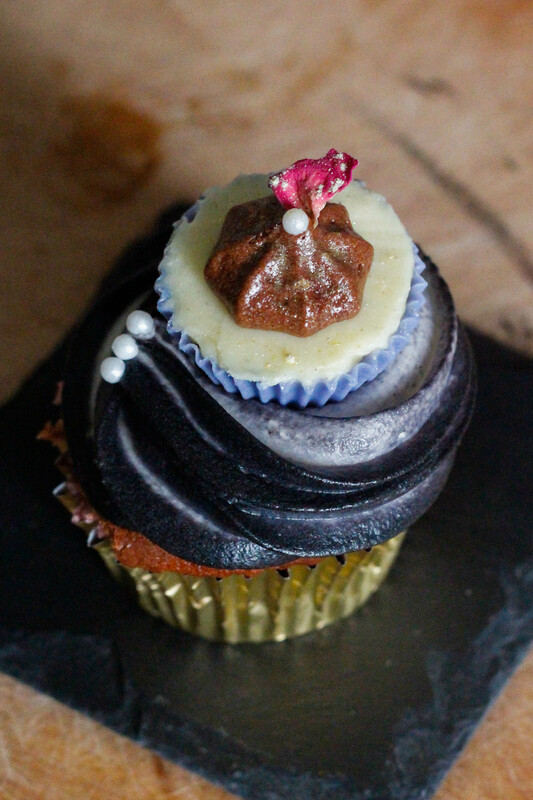 Place the ganache into a piping bag and set aside to cool. 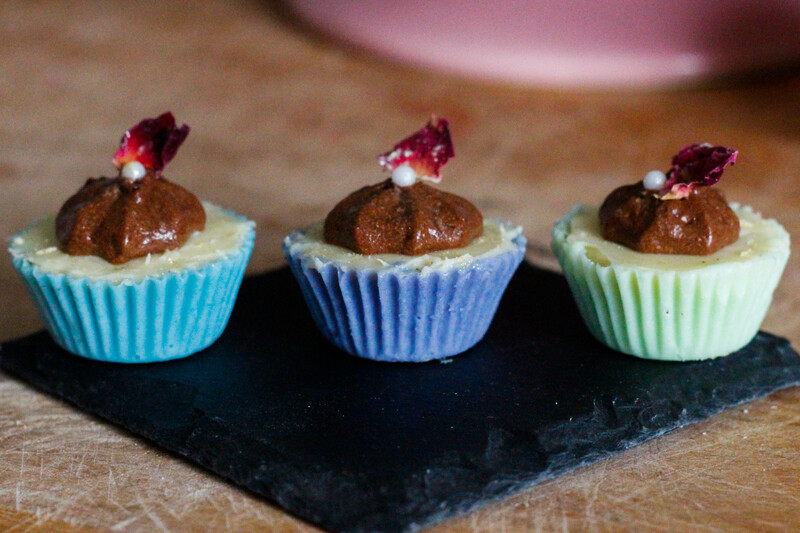 Take the chocolate cases from the freezer once they are set and peel off the wrappers, then cut off the tip of the piping bag containing the cooled ganache and fill each cup. Smooth off the tops with a palette knife. Save the remaining ganache for the cake frosting. Top each chocolate with a small amount of mousse using the piping bag, then refrigerate the chocolates. Whisk together the milk and flour in a saucepan so that there are no lumps, then place over a low heat and continue to stir. Once the mixture has thickened, cook for a further minute or so then turn off the heat and set aside to cool completely. Once the flour mixture has cooled, beat the butter and sugar until light and fluffy. Add half the cooked flour mixture and beat until combined, then add the rest of the flour mixture and continue beating until the sugar has dissolved completely and the mixture is pale and fluffy. Add the white chocolate ganache, then take the cream cheese and beat until smooth in a separate bowl. Add the cream cheese to the frosting mixture one half at a time, beating only briefly until just combined. Refrigerate until ready to use. 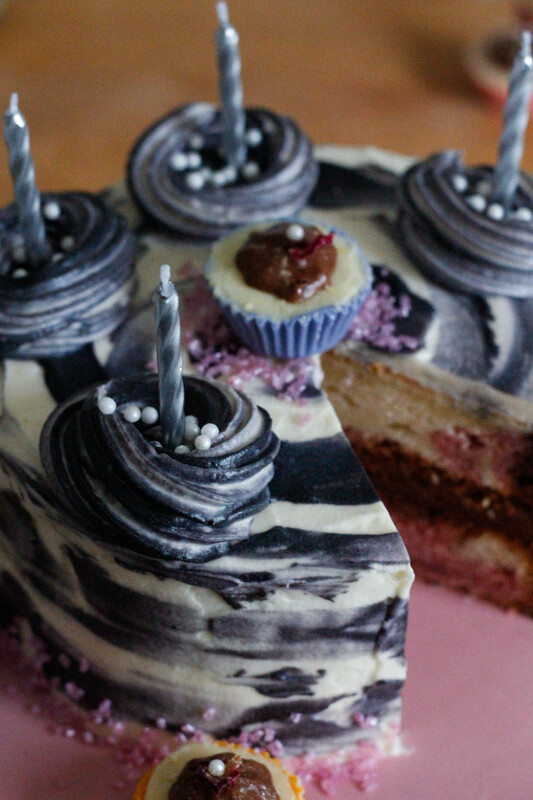 Take the mousse filled marble cake from the fridge and turn out onto your cake stand. 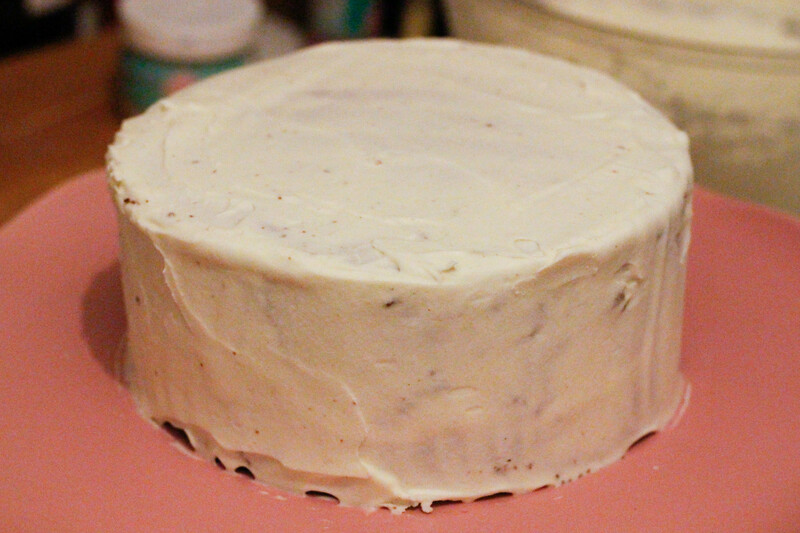 Remove the plastic and crumb coat the cake generously, then refrigerate for 20 minutes. 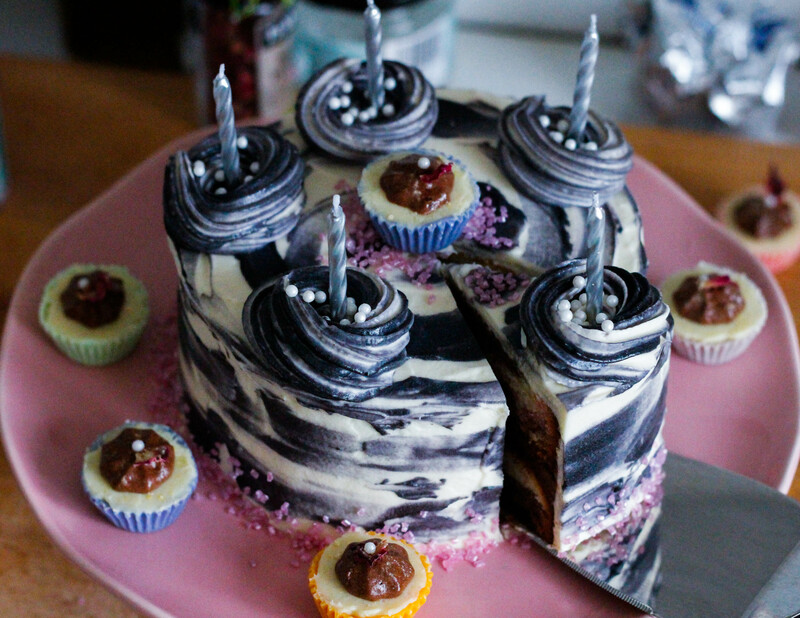 Apply another layer of frosting to the cake, then take a few spoonfuls of the icing and colour with black food colouring. 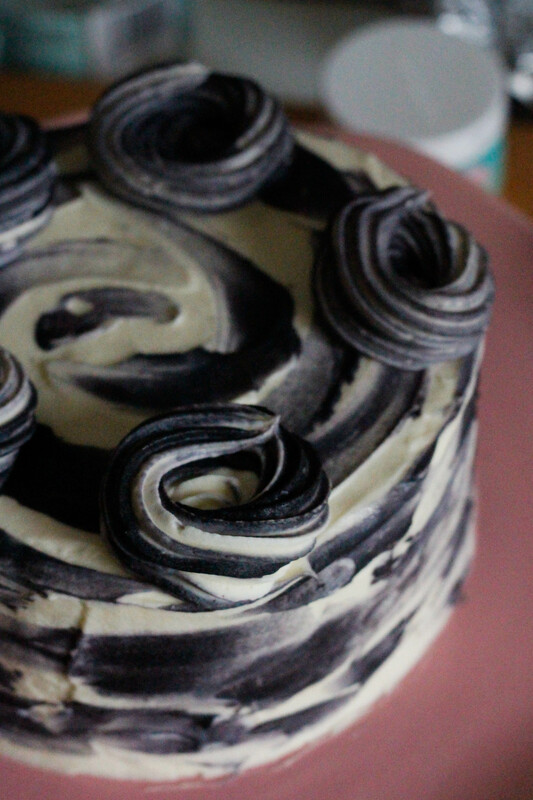 Use the back of a spoon to swipe dollops of the black icing onto the cake, blending it lightly as you go. 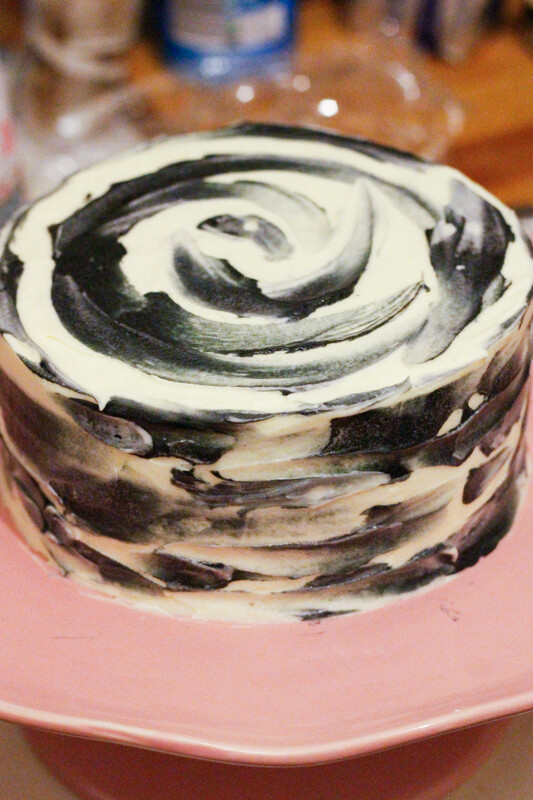 Pipe and decorate as you please… I used a closed star piping tip for the swirls on this cake.